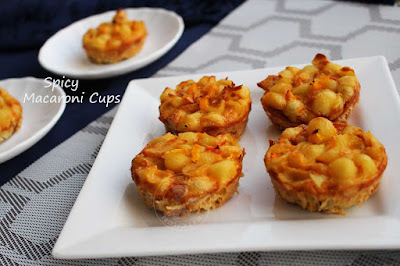 These macaroni cups are baked in a muffin tin for a quick and easy snack for kids. 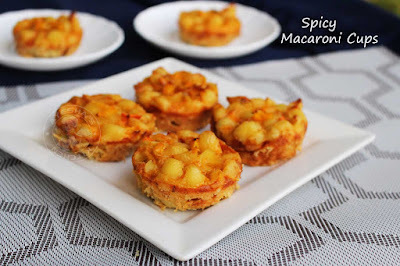 Like most of the snacks recipes, this macaroni cups recipe is also adaptable. You can add beef, mutton or veg instead of chicken. You can also use shredded cheese to top it with which makes this appetizer more yummy. As my kids crave for pasta recipes, macaroni has always been a staple food in our family. Snacks....I love to try more varieties in snacks recipes than breakfast, lunch and dinner meal. This spicy macaroni cup recipe is both kids and adults friendly. I made every preparation work ahead of time and baked the next day to serve for an evening snack. Do try this crowd pleaser and hope you all enjoy this classic pasta dish. This tastes really really fantastic along with a cheesy flavor. 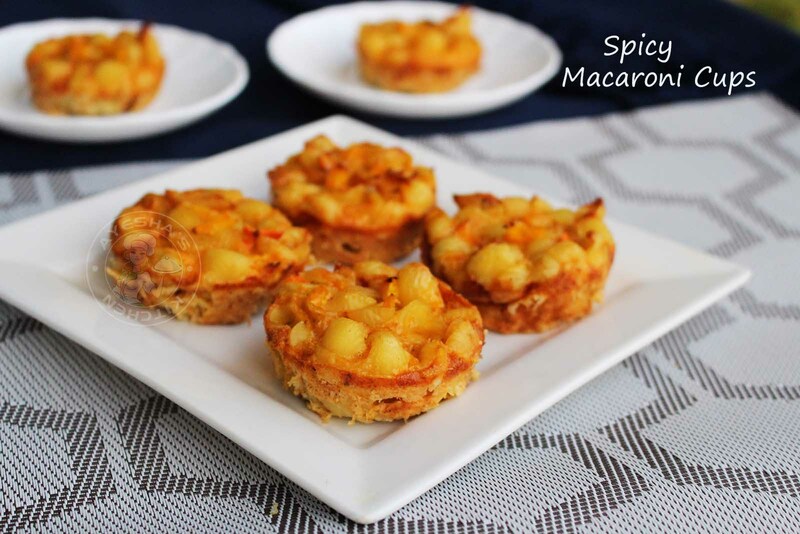 So those who love mac and cheese recipes, do sprinkle some cheese over these cups while baking. First, make the filling. Heat a pan with 2 tsp of oil. Saute onion until soft and then add ginger garlic paste. Saute until the raw smell disappears. To this add shredded chicken along with grated carrot(cook chicken pieces along with turmeric powder, salt and then shred the chicken once done). Saute very well. Add chicken masala powder and pepper powder. Check for salt. When done, transfer it to a bowl. Cook macaroni (i used the small variety) with enough water along with salt and oil. Cook for 8 minutes or as per the direction on the package. When done, drain it into a colander and combine it well with some oil to avoid stickiness (optional). Set aside. Now add eggs in a blender. Blend well. Pour it into a bowl. Mix together cornflour with two tbsp of milk and mix well with the egg mixture. Then add chicken filling and cooked macaroni. Combine very well. Finally add pizza sauce, pepper powder and check for salt. Grease the cupcake mould with butter. Spoon the mac into lightly greased muffin tin. Bake at 180 degree C for 10 minutes or until done. Avoid browning of these mac cups. Once done, let it set aside after removing the tray from oven. (it is very important to hold the shape of the cups). As am in a hurry, I just separate immediately to take photos of the same. After 10 minutes, take the cups out with a sharp knife. Serve hot with ketchup or any dipping sauce.